Liberalism Ain’t What It Used To Be. Don’t Let Democrats Hide Behind This Word. At the root of the word “Liberal” is the Latin “Liber” which means, “Free Man.” It’s no coincidence that this is also at the root of the word liberty and libertarian. Many libertarians call themselves classic liberals, because liberal and libertarian are, or at least should be and used to be, essentially synonymous. However, modern-day Democrats have hijacked this word to describe themselves, and I suspect that there are a number of reasons why. Let’s analyze a few. Since liberal started out as someone described as a free man, it stands to reason that free men would have been about advancing mankind in general through the benefits of free thought. It is true that Democrats of the modern era have been quicker to embrace things like gay marriage rights, marijuana legalization, and other social liberties. Since they are often promoting freedom on such social issues, unlike many of their Christian-conservative counterparts, it is fair to call their positions there liberal. So the word just evolved to be synonymous with Democrats despite the fact it’s meaning is often incongruent with their beliefs. 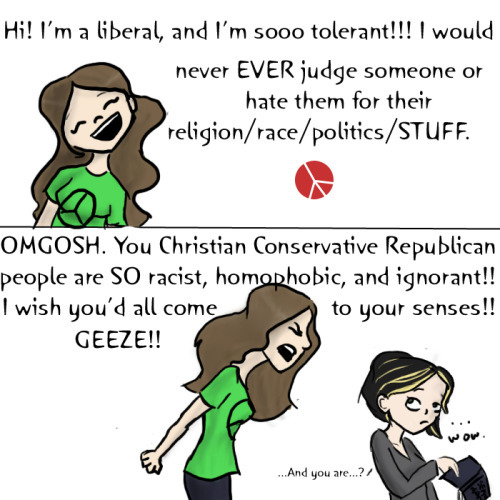 But liberal should mean that you are accepting of all beliefs, even of those contradictory to your own. Ask a Democrat how they feel about libertarians, Fox News, or anyone right of center, and they are often condescending and apoplectic. To some extent, you are what you believe yourself to be, and I hate when people insultingly call a person who identifies as a Republican a RINO, or refer to me as a “so-called” libertarian because I believe in some amount of government. But nonetheless, for people who identify as liberals, they’re rarely actually being liberal in their beliefs. I would like to believe people are honest for the most part, but many people who in certain circles admit to being statist, socialist, or communist (I’ll use the word statist to describe all three for the sake of simplicity going forward), publicly call themselves a liberal. Maybe they simply don’t know any better, but statism of any kind is certainly the polar opposite of liberal. But the cold war solidified the idea in America that statism is a very bad thing. So when someone who is a statist admits to it, it’s a sure-fire way to ensure you don’t get votes. So instead, they use the much friendlier sounding “liberal” so as not to scare independent voters away who might not be too keen on casting their vote for a statist. While it’s a shady tactic, if you care about winning more than your integrity, it’s not much of a stretch to do this. However, if your ideas are so great, shouldn’t you be proud of them and stand behind them 100%? I’m proud to be a libertarian, and never claim to be anything different. It’s a shame these statists masquerading as liberals don’t have the same honest conviction. To be a statist, you essentially have to believe that government knows better than you, in regards to important matters. Intelligent people generally just want to be left alone to sink or swim however they see fit, but ignorant people think that they can’t survive without a government safety net wherever they go. Since Democrats, who are largely statist in their views call themselves liberals, it stands to reason someone not intelligent enough to manage their own affairs, isn’t intelligent enough to understand the difference between a statist and a liberal. So having little understanding of the etymology of “liberal,” they call themselves one simply by association. If I go back to the deceit aspect for a moment, whether it be honest deceit through ignorance, or willful deceit by a dishonest statist politician trying to win a vote, it shouldn’t matter. To those of use libertarians and Republicans who form the opposition, we shouldn’t assist them in this charade. If you are someone who loves liberty as I do, I implore you not to allow these people to call themselves liberals without calling them on it. If they are championing a non-rights-defending role of government, tell them that’s not a liberal position, that’s a statist one. If you are using social media, and referring to a statist-minded person, don’t ever call them liberal, call them the statist that they are. If they complain, rightly point out that they just championed a state-run position, therefore they are being statist, not liberal, and that you’re just being honest. Remember, it’s not an insult, and you’re not being rude or condescending doing so, you are truly being accurate. If they don’t like being called statists, they shouldn’t behave like statists. If they firmly believe in their statist views, then tell them to embrace what they are and be honest about it. But for the love of liberty, stop helping them perpetuate the lie.